Urinary tract infection (UTI) is the most common commonly diagnosed infection in the United States. However, a high incidence of diagnoses does not render those diagnoses appropriate. Increasing evidence suggests that this common condition poses a serious diagnostic challenge. Erroneously identified UTIs frequently result in inappropriate treatment, as well as delays in management of the true underlying pathology. In an era where ever more terrifying multi-drug resistant organisms continue to emerge, increasing emphasis is placed on evidence-based practice and antimicrobial stewardship. In the acute care setting, where information is limited and time is scarce, guideline-based management can aid the Emergency Physician (EP) in improving both individual and community-level outcomes. Despite increased awareness of UTI’s role in antimicrobial stewardship and cost-effective care, leading interest groups have failed to create a consensus definition of UTI. (For an interesting experiment ask your colleagues what they consider diagnostic criteria for UTI, and prepare for wide variability). Generally speaking, UTI is a diagnosis arrived at by two core features: 1) laboratory testing suggestive of infection, of which urine culture is considered gold standard; and 2) clinical symptomatology. Herein lies a major quandary for the Emergency Physician EP – culture data is not available in a timely fashion, and determining what defines a “symptom” of a UTI is, at best, elusive. In the absence of culture data, the EP must rely upon a urinalysis (UA), with or without microscopy, as a surrogate. Certain elements of the UA are thought to be particularly predictive of a true infection, including leukocyte esterase, nitrite, white blood cells, red blood cells, and bacteria. However, when considered either alone or in combination, there is variable sensitivity and specificity of nearly all elements of a dipstick or UA. Even when both leukocyte esterase and nitrite are present, the sensitivity and specificity is too poor to definitively diagnose or exclude a UTI. Part of the poor predictive performance of UAs may be attributed to poor collection techniques and the presence of chronic bactiuria. Obtaining a clean-catch sample in the emergency department setting can be a formidable challenge. Studies suggest less than 10% of ED patients use proper midstream clean-catch techniques. Concerningly, 50% of patients with a contaminated urine sample receive inappropriate intervention and antibiotics. Proper education on sampling techniques as well as and in and out catheterization when appropriate, should be routinely employed. Despite adequate sample collection, UA interpretation is frequently confounded by the presence of asymptomatic bactiuria (ASB). While definitions vary, the Infectious Disease Societies of America (IDSA) define ASB as isolation of a specified quantitative count of bacteria (105 cfu/ml from clean catch specimens) in a patient without symptoms or signs referable to urinary infection, such as frequency, urgency, dysuria, or suprapubic pain. ASB is common in the geriatric population, and prevalence increase with age and in institutionalized patients. ASB, like UTI, will frequently yield a UA positive for bacteria, LE, nitrate, and pyuria, therefore rending the UA of little use in differentiating between these two conditions. Given these considerations, the clinical symptoms become the most important factor in making the correct diagnosis. When considering the diagnosis of UTI, beginning with an assessment of patient signs and symptoms seems not only rational, but intuitive. However, in the ever-increasing drive for efficiency, UAs are frequently drawn indiscriminately to expedite work-up. In a recent study of patient treated for UTI in an ED population, 2/3 of patients diagnosed with a UTI had a UA collected as part of an order set, often before being evaluated by a clinician. It was also found that antibiotics were administered inappropriately in 59% of those patients, due to lack of clinical signs or symptoms to substantiate a diagnosis of UTI. Going about the diagnostic work-up in a backwards way invites not only anchoring bias when a UA is positive, but places pressure on the clinician to treat a UTI that isn’t. Clinicians require discipline in looking beyond an abnormal UA, and work to objectively determine if the criteria for UTI are met based on symptomatology – or better yet – order UAs only when symptoms warrant further investigation. According to the most contemporary guidelines, these nonspecific symptoms without localizing symptoms or fever, are no longer sufficient to support the diagnosis of UTI. This represents a shift in not only traditional clinical teaching, but a departure from prior guidelines. This change results from a realization that both asymptomatic bactiuria and altered mentation are prevalent in the geriatric population, and there is a paucity of evidence supporting a causal link between these findings. Despite these new recommendations, altered mentation, confusion, weakness, and falls are among the most frequent reasons for obtaining a UA in the geriatric population. In a population where ASB is prevalent, and procuring a clean urine sample is challenging, geriatric patients are at high risk of morbidity from inappropriate antibiotic therapy and unnecessary testing. Perhaps more concerning is that with a presumptive diagnosis of UTI, little thought may be devoted to other potential diagnoses – at least until the patient fails to improve. Little, P., et al. "Dipsticks and diagnostic algorithms in urinary tract infection: development and validation, randomised trial, economic analysis, observational cohort and qualitative study." Health Technol Assess 13.19 (2009): 1-73. Van Nostrand, Joy D., Alan D. Junkins, and Roberta K. Bartholdi. "Poor predictive ability of urinalysis and microscopic examination to detect urinary tract infection." American journal of clinical pathology 113.5 (2000): 709-713. Schulz, Lucas, et al. "Top Ten Myths Regarding the Diagnosis and Treatment of Urinary Tract Infections." The Journal of emergency medicine (2016). Bent, Stephen, and Sanjay Saint. "The optimal use of diagnostic testing in women with acute uncomplicated cystitis." The American journal of medicine 113.1 (2002): 20-28. Klausing, Benjamin T., et al. "The influence of contaminated urine cultures in inpatient and emergency department settings." American Journal of Infection Control (2016). Gupta, Kalpana, et al. "International clinical practice guidelines for the treatment of acute uncomplicated cystitis and pyelonephritis in women: a 2010 update by the Infectious Diseases Society of America and the European Society for Microbiology and Infectious Diseases." Clinical infectious diseases 52.5 (2011): e103-e120. Nicolle, Lindsay E., et al. "Infectious Diseases Society of America guidelines for the diagnosis and treatment of asymptomatic bacteriuria in adults." Clinical Infectious Diseases (2005): 643-654. Detweiler, Keri, Daniel Mayers, and Sophie G. Fletcher. "Bacteruria and Urinary Tract Infections in the Elderly." Urologic Clinics of North America 42.4 (2015): 561-568. Kiyatkin, Dmitry, Edward Bessman, and Robin McKenzie. "Impact of antibiotic choices made in the emergency department on appropriateness of antibiotic treatment of urinary tract infections in hospitalized patients." Journal of hospital medicine (2015). Horan, Teresa C., Mary Andrus, and Margaret A. Dudeck. "CDC/NHSN surveillance definition of health care–associated infection and criteria for specific types of infections in the acute care setting." American journal of infection control 36.5 (2008): 309-332. Posted on November 26, 2018 by NUEM Blog and filed under Infectious Disease and tagged UTI UA geriatrics. Sepsis, a maladaptive host-response to infection, is a leading cause of morbidity and mortality within the healthcare system. We have known about and discussed this disease for decades, but recently have begun to alter our criteria for its diagnosis. Since 1991, we have categorized sepsis as a derangement in physiologic or laboratory parameters caused by a host’s systemic inflammatory response to an infection . Two of 4 criteria, listed below, must be met in addition to a suspected source of infection. Sepsis complicated by end-organ dysfunction was deemed severe-sepsis. And sepsis-induced hypotension refractory to adequate fluid resuscitation was deemed septic shock. Using these definitions, multiple studies have resulted in consensus guidelines that reduce morbidity and mortality, including early adequate fluid resuscitation, obtaining blood cultures before antibiotic therapy, administration of broad-spectrum antibiotics within 1 hour of diagnosis, and use of norepinephrine as a first-line vasopressor to maintain MAP > 65 mmHg2. Recently, due to presumed limitations in the original definition, a task force was convened and a new definition was proposed. They define sepsis as life-threatening organ dysfunction caused by a dysregulated host response to infection . This organ dysfunction is calculated using the Sequential Organ Failure Assessment (SOFA) Score. While the original is quite cumbersome, the qSOFA score is a simplified version easily used at the bedside. While qSOFA has already shown promise in predicting patients with sepsis at risk for increased mortality , it remains to be seen whether it is useful at screening patients for sepsis early in the disease process. Comparison of qSOFA score and SIRS criteria as screening mechanisms for emergency department sepsis. Haydar S, Spanier M, Weems P, Wood S, Strout T. Am J Emerg Med. 2017 Jul 6. pii: S0735-6757(17)30509-0. This study was a retrospective chart review performed at a single academic tertiary care hospital. Its primary objective was to determine both the sensitivity and the diagnostic timeliness of the qSOFA score compared to SIRS criteria in a population of emergency department patients. While not explicitly stated, its secondary objective was to determine the test characteristics (including sensitivity, specificity, negative predictive value, positive predictive value, and the area under the receiver operatic characteristic curve) of qSOFA and SIRS to identify septic patients that would ultimately die in-hospital. The sample of patients were drawn from a base population that was treated with antibiotics in the ED for a suspected infection, admitted, and ultimately expired or subsequently discharged with a Center for Medicare Services Diagnosis Related Grouping (DRG) for sepsis. Data were extracted to fulfill the criteria for both qSOFA and SIRS, including respiratory rates, systolic blood pressures, heart rates, white blood cell counts, temperatures, altered mental status (AMS), and the times at which these parameters were documented. Pre-hospital data was excluded. Of note, both physician and nursing documentation were reviewed. Interestingly, laboratory values (i.e., WBC count) were considered to be present at the time of the blood draw, not at the time of result. Data was extracted by a single reviewer for all data points except for the timing of AMS. During a random sampling by two reviewers to determine reliability, the kappa value of 0.4 was deemed inappropriate, prompting a consensus review of all charts to determine initial time of AMS. Of the 200 sampled patients, one was excluded due to transfer from an outside facility, leaving 199 for analysis (Table 1). Of note, median age was 71 years (range 18-102) and in-hospital mortality was 11.0% (n = 22). The majority of patients were white (97%, n = 194) and Non-Hispanic (100%, n = 200). SIRS criteria outperformed the qSOFA score in sensitivity for diagnosing sepsis while in the ED, mean time to diagnosis, and median time to diagnosis (Table 2). The overall sensitivity for qSOFA was quite poor, and in particular, only 36.7% of patients met the AMS requirement. In determining in-hospital mortality, qSOFA had a much higher specificity and positive predictive value, but ultimately the overall performance as evidenced by the AUROC was relatively poor for both SIRS and qSOFA and they did not differ significantly (Figure 1). 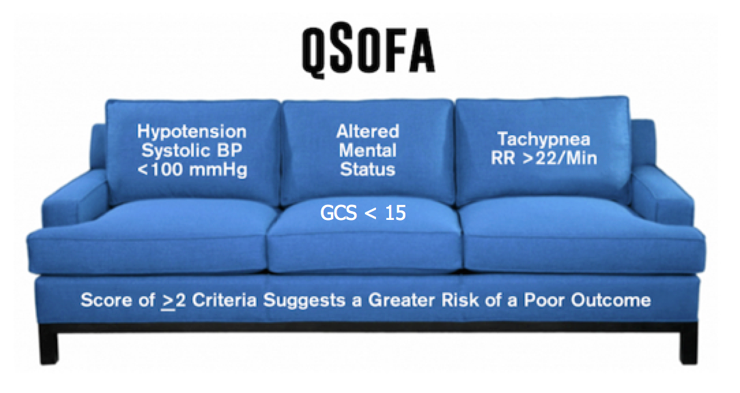 qSOFA came after years of criticism towards the SIRS criteria. It has long been recognized that the SIRS criteria are not specific for infection, and that a variety of conditions including pain, trauma, and nonspecific inflammation can place patients in a SIRS-positive category. A recent study demonstrated that nearly half of hospital ward patients developed positive SIRS criteria at least once during their stay . If not categorized appropriately, this could lead to inappropriate antibiotic utilization and fluid resuscitation. However, the introduction of qSOFA the Sepsis-3 criteria has its own inherent limitations. Primarily, the focus has shifted towards hypotension and altered mental status as markers of end-organ dysfunction. While these features are intuitively associated with a higher disease burden (i.e., altered patients and those that are hypotensive are clearly sicker than those that are not), it shifts the focus from screening to prognostication. While high qSOFA scores have proven to correlate with in-hospital mortality , is this really the most important question for the emergency department physician? More useful is a tool that screens positive for the largest proportion of potentially infected patients, leaving clinical judgment to further distill appropriate workup and treatment. This paper suggests that SIRS criteria are much better suited for this purpose. Compared to qSOFA, SIRS had a sensitivity for diagnosing sepsis that was over 36% higher, with a reduction in time to diagnosis by approximately one half. The major strength of this paper is the wide net of inclusion. Essentially, all patients admitted and subsequently diagnosed with sepsis were included and randomly sampled. This group spanned a variety of ages, acuities, and types of infections. This was a strong attempt at making the data as generalizable as possible. However, the population at Tufts Medical Center in Maine, predominately White and Non-Hispanic may limit the external validity to more diverse practice environments. Timing of diagnosis was another factor fraught with both pros and cons. While not explicitly stated, it seems intuitive that nursing documentation review in addition to physician notes would allow for expedited recognition of vital sign abnormalities and the onset of AMS. However, even with this inclusion, the retrospective determination of AMS onset without objective documentation practices is prone to error. One can imagine that late documentation in a busy emergency department setting may have contributed to the delay in time from arrival to documentation of qSOFA criteria. Furthermore, it seems odd that the laboratory results were considered to be present at the time of blood draw rather than at the time of result availability. Clinically, this is not how we would be able to diagnose sepsis in real-time, and it may have falsely hastened the time from ED arrival to documentation of SIRS criteria in this study. Lastly, it is important to recognize that the Surviving Sepsis campaign has championed early recognition and treatment as the key principle to reducing morbidity and mortality. This has led many hospital systems to incorporate SIRS criteria into the electronic health record, to flag patients as early as possible for recognition. This is not as feasible with qSOFA, as the component of altered mentation is subject to individual interpretation. In summary, sepsis is a critical diagnosis that must be made early to improve outcomes. The SEPSIS-3 campaign promotes the use of qSOFA criteria, which are clearly a prognostic marker for increased mortality. However, the SIRS criteria are more useful in screening for sepsis early in the disease process in emergency department patients. As Dr. Ireland’s excellent review of this attempted validation study notes, what was originally heralded as a new paradigm in identifying the warning signs of sepsis (qSOFA) appears to in fact be (significantly) worse than the SIRS criteria we all know and (don’t) love. While SIRS isn’t perfect, it at least approaches the requisite sensitivity to make it a useful screening test. It is important to remember that you as the clinician are tasked with providing the specificity - the warning signs of sepsis overlap with many other acute (and less acute) processes. Patients screening SIRS positive may need aggressive management of conditions other than sepsis, and not every sepsis patient must receive the full sepsis bundle - evaluate each patient fully before initiating protocol-based care. BoneRC, BalkRA, CerraFB, etal. American College of Chest Physicians/Society of Critical Care Medicine Consensus Conference: definitions for sepsis and organ failure and guidelines for the use of innovative therapies in sepsis. Crit Care Med. 1992;20(6):864-874. Dellinger RP, Levy MM, Rhodes A, et al. Surviving sepsis campaign: international guidelines for management of severe sepsis and septic shock: 2012. Crit Care Med 2013;41(2):580–637. Singer M, Deutschman CS, Seymour CW, et al. The third international consensus def- initions for sepsis and septic shock (sepsis-3). JAMA 2016;315(8):801–10. Freund Y, Lemachatti N, Krastinova E, et al. Prognostic accuracy of sepsis-3 criteria for in-hospital mortality among patients with suspected infection presenting to the emergency department. JAMA 2017;317(3):301–8. Posted on September 17, 2018 by NUEM Blog and filed under Infectious Disease and tagged SIRS qSOFA sepsis. Asymptomatic bacteriuria (ASB) is a prevalent condition in the elderly population. Bacterial colonization of the genitourinary (GU) tract increases with age and institutionalized status. Though once thought to be pathogenic, randomized trials clearly demonstrate that treatment of ASB with antibiotics does not improve outcomes, except in pregnant patients and those undergoing GU procedures. Emerging data even suggest there may be a protective effect of colonizing bacteria. Conversely, there is increasing recognition of the dangers of inappropriate antibiotic use, both to the individual and the general population, and widespread agenda to limit unnecessary antimicrobial use. As the antibiotic stewardship movement marches forward, the treatment of ASB continues to be a central focus. Recent guidelines emphasize that the presence of lower GU symptoms is the key distinction between UTI and ASB. This strategy may be easily adopted in young otherwise healthy patients, but reaches a major stumbling block when considering the elderly population. This is in part due to the fact that many clinicians believe that there is a causative relationship between UTI and delirium in the absence of other localizing symptoms or signs of systemic infection. In other words, delirium is the symptom that substantiates a diagnosis of UTI in the presence of otherwise asymptomatic bacteriuria. This concept, now generations old, is still taught in many medical school curricula. The correlation between delirium and UTI is so well established in the minds of clinicians that many have never questioned whether this presumed association is rooted in data. The concerning truth is that there is no reliable evidence to suggest that such a relationship between delirium and UTI exist. A recent review of the literature found only five papers addressing this association primarily, all were observational and therefore lacked the ability to make conclusions about the degree of causation. All studies were severely methodologically flawed, and none were case-control, cohort, or RTCs. Additionally, there is no physiologic evidence or models to suggest that bacteriuria in the absence of systemic illness, results in cognitive dysfunction. No known studies have ever shown that treatment of otherwise asymptomatic bacteriuria improves delirium outcomes. Taking these data into account, the CDC and SHEA created guidelines specifically do not include delirium as a reason to treat potential UTIs in non-catheterized patients. These represent a departure from earlier guidelines that included altered mental status as a symptom of UTI in the elderly. The new SHEA recommendations have been tested in a large randomized trail and were found to be safe when compared to standard care. Despite efforts to shift practice patterns in the direction of a more guideline-based management, ASB continues to be unnecessarily treated at high rates in the elderly. One reason may be that anecdote is a powerful source of bias. Many clinicians support their belief of a causative correlation between UTI and delirium by referencing cases where patient presented with confusion and were found to have a UTI. The problem is, how was that “UTI” diagnosed? The distinction is more than just semantics. In the absence of GU symptoms and signs of systemic infection, then the clinician made the diagnosis solely on the basis of a UA and urine culture. 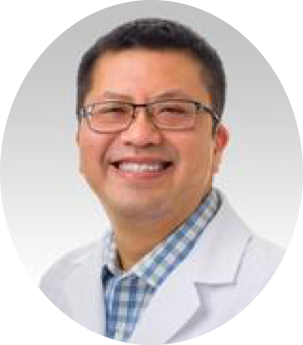 But as previously discussed, both a UA and culture will frequently be positive in both ABS and UTI, and cannot reliably distinguish between the two conditions. Many clinicians will cite the fact that the patients may improve following antibiotic administration, thereby confirming their suspicion of a presumed UTI-related delirium. However, delirium frequently is short lived and self-resolving, therefore improvement is likely to be simply coincidental. In addition, along with antibiotics administration patients also often receive intravascular volume, thereby improving hydration status, which is a frequent cause of delirium. These factors confound the ability of the clinician to objectively interpret the causative relationship between the delirium and bacteriuria. High quality randomized trials will be needed to further clarify these issues and assess is the high rate of concurrence of bacteriuria and delirium is due to causation or simply coincidence. Pines JM, Mullins PM, Cooper JK, Feng LB, Roth KE. National trends in emergency department use, care patterns, and quality of care of older adults in the United States. Journal of the American Geriatrics Society. 2013;61(1):12-17. Balogun SA, Philbrick JT. Delirium, a Symptom of UTI in the Elderly: Fact or Fable? A Systematic Review. Canadian geriatrics journal : CGJ. 2014;17(1):22-26. Finucane TE. "Urinary Tract Infection"-Requiem for a Heavyweight. Journal of the American Geriatrics Society. 2017;65(8):1650-1655. Ninan S. Don't assume urinary tract infection is the cause of delirium in older adults. Bmj. 2013;346:f3005. Working Group on Health Outcomes for Older Persons with Multiple Chronic C. Universal health outcome measures for older persons with multiple chronic conditions. Journal of the American Geriatrics Society. 2012;60(12):2333-2341. Kuluski K, Hoang SN, Schaink AK, et al. The care delivery experience of hospitalized patients with complex chronic disease. Health expectations : an international journal of public participation in health care and health policy. 2013;16(4):e111-123. McKenzie, Robin, et al. "Bacteriuria in individuals who become delirious." The American journal of medicine 127.4 (2014): 255-257. Balogun, Seki A., and John T. Philbrick. "Delirium, a symptom of UTI in the elderly: fact or fable? a systematic review." Canadian Geriatrics Journal 17.1 (2013): 22-26. Nace, David A., Paul J. Drinka, and Christopher J. Crnich. "Clinical uncertainties in the approach to long term care residents with possible urinary tract infection." Journal of the American Medical Directors Association 15.2 (2014): 133-139. Gau, Jen-Tzer, et al. "Interexpert agreement on diagnosis of bacteriuria and urinary tract infection in hospitalized older adults." J Am Osteopath Assoc 109.4 (2009): 220-226. Juthani-Mehta, Manisha, et al. "Interobserver variability in the assessment of clinical criteria for suspected urinary tract infection in nursing home residents." Infection Control & Hospital Epidemiology 29.05 (2008): 446-449. Posted on July 30, 2018 by NUEM Blog and filed under Infectious Disease and tagged UTI Delirium. Testing for HIV in the emergency department (ED) has become a vital topic and policy in hospitals across the country. Early diagnosis of HIV is critical in decreasing transmission rates, in addition to providing better outcomes for patients, as early diagnosis often leads to earlier treatment. Today we discuss how to counsel patients with a new diagnosis of HIV in the ED. Posted on February 13, 2017 by Michael Macias and filed under Infectious Disease and tagged HIV acute hiv infectious disease new hiv counseling. Skin infestations are frequently encountered in the ED, particularly among the homeless population, though data on the number of visits are lacking. While patients with infestations may seem like pests in the middle of a busy shift, these conditions can be a public health menace, and may be markers of serious underlying pathology. Posted on January 9, 2017 by Michael Macias and filed under Infectious Disease and tagged infestations infectious disease bugs bed bugs. Before labeling a patient as an “influenza like illness” what other potentially life-threatening flu mimics should be considered? Specific clinical questioning will help you to narrow your differential diagnosis. Posted on September 26, 2016 by Michael Macias and filed under Infectious Disease and tagged hiv uri acute hiv acute retroviral syndrome ili Influenza Influenza Like Illness Cough Fever ILI mimics. Consider acute retroviral syndrome like endocarditis or meningitis or epidural abscess: another life threatening cause of a seemingly benign febrile illness that we must recognize. HIV infection, especially in its primary phase, represents a life threatening malady that could have serious implications on the patient and the public health at large if not diagnosed. Posted on April 5, 2016 by Michael Macias and filed under Infectious Disease and tagged acute hiv hiv acute retroviral syndrome febrile illness aids infectious disease.